At Celibre Medical, one of our laser hair removal specialists will meet with you, examine the area of unwanted hair that you are interested in treating and take a full medical history. This includes a special skin-typing questionnaire that helps us determine what your baseline skin tone is. We want to ensure you’re a good candidate for laser hair removal, and we also use these tools to help us determine which of our lasers would be the safest and most economical choice to get you to your goal of smooth, hair-free skin. We are also happy to discuss your goals and concerns about treatment, as well as answer any questions that you may have. For the actual treatment itself, most patients describe it as mildly uncomfortable. Our technologies use a chilled, cooling tip that sits on the skin’s surface. While this does help some with discomfort, it is important to cool the outer layer of the skin for safety too. When the laser is fired, it may feel like a rubber band snap, but it’s a very quick sensation. That is the laser energy being absorbed by the follicle and then quickly dissipated. Most patients say that waxing and electrolysis are more uncomfortable. Electrolysis uses an electrical current to heat up the follicle and damage it, but the process is extremely slow and tedious. Only one follicle can be treated at a time compared to multiple hair follicles that can be simultaneously treated with a laser. With waxing, it’s a relatively quick sensation of the hairs being ripped out of the follicles, but its one that you have to endure over and over and over again! Usually every 6-8 weeks…forever! With laser hair removal, the discomfort may last a bit longer, but not much. And once your series of treatments is done, you can sit back and enjoy your smooth skin! I’m sure you can find another good use of that time you used to spend waxing every other month! 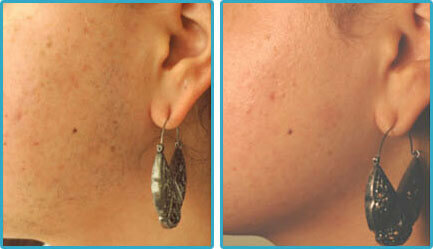 If you’re looking for a more permanent solution to your unwanted hair problems, please give us a call today. We are offering 15% off of your treatments this month and can get you in at either our Orange County or Los Angeles offices today!